We already knew that Windows 10 had lot of inspiration for the mobile platforms, but the upcoming Creators Update will blur the lines even more, with a new option that allows you to restrict app installation to those downloaded via Windows Store alone. With Windows 10 Creators Update, users or network administrators can prevent the installation of apps that are not downloaded via Windows Store - basically turning Windows 10 into an iOS replica; or rather, Android, as there will still be the possibility of allowing the installation of apps from any source, as it happens so far. The implications are obvious in terms of security, since we can only install apps that have been verified and approved by Microsoft (although this is not a 100% guarantee that the most creative malware can not continue to infiltrate the store and reach the users), and at least will help alerting malware installation attempts with a warning of unsafe apps. Luckily this time MS had the good sense to make this option disabled by default, so the responsibility to activate it will be up to each one. An option that may leave many users vulnerable (not any more than they currently are), but avoids the guaranteed influx of complaints that would arise if MS blocked the installation of apps on its own accord. 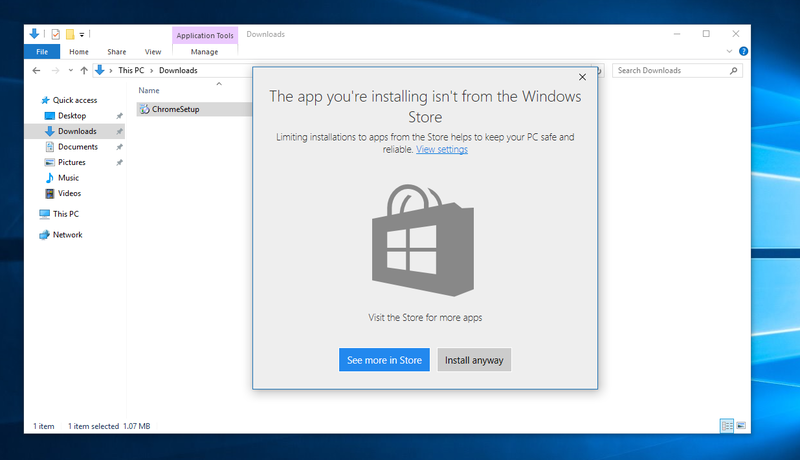 ... Hopefully, this is not simply the first step to a future in which this option stops being an option, and Windows 10 becomes an OS that can only run apps installed via Windows Store!